I have read plenty of horror novels in my time. Almost all of them have started well, creating an unsettling atmosphere full of creepy chills. Where I find many horror writers go wrong, however, is in failing to build this mounting unease to a suitably scary climax. I'd find a lot of horror far more satisfying if the authors could just deliver on a book's early promise, sustaining the scares to the end, but all too often, a horror novel will start well but will descend into daftness in its final quarter, as if the author used up all their best efforts earlier in the book and then panicked. 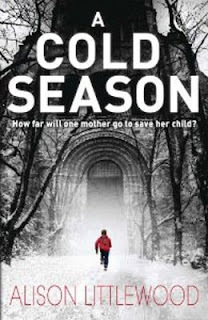 Unfortunately, A Cold Season, the first novel from Alison Littlewood, does suffer a little bit from Daft Horror Climax Syndrome, which is a great pity as the book starts extremely well. Cass, recently widowed by the death of her soldier husband in Afghanistan, takes her young son Ben to live in a small Pennine village in the Saddleworth Moor area, where she once grew up with her now estranged father, the parish priest. But the converted mill in which Cass rents a flat seems oddly deserted, and when the snow begins to fall, cutting off the village entirely, events take a very sinister turn. A Cold Season is a story that strikes me as being in the 'folk horror' tradition, but while there are echoes of The Wicker Man, there's also a hint of Rosemary's Baby. There's a strong sense of atmosphere that certainly does evoke the bleak isolation of Saddleworth Moor - it isn't far from Manchester, where I now live, and I know it well. The odd goings-on that begin to disturb Cass offer creepy clues to the villagers' secrets and as Ben begins to make friends with the sullen village children, his gradual descent into sly cruelty prompts many a shudder. I found myself racing through A Cold Season at first, shivering at each new hint of Something Wrong in the village, with its history of witchcraft and rural devil worship, and eagerly anticipating a dramatic end. Sadly, it was at this point that I felt A Cold Season lost its way. The sudden appearance of a couple of characters at the last minute, one of whom in circumstances that were simply absurd on any practical level, felt like a terrible cop-out to me: like Cass arriving for the novel's final stand-off on a frozen lake, the plot skids on awfully thin ice here. Moreover, there were times when I felt Cass' actions simply weren't quite convincing, particularly when it came to certain decisions she made about her son - although as revelations began to unfold about certain other characters, it did become a little easier to see how and why she might have been manipulated or misled. A Cold Season does, I must admit, recover for an interesting epilogue-style ending which leaves the idea open for a sequel, though, and all daft endings considered, I certainly don't regret the hours I spent reading this one. It has its faults, but if you're looking for a supernatural thriller with an emphasis on spooky rural chills, an easy, gripping read with the sinister atmosphere of a British-made low-budget 70s horror film, you could do a lot worse than A Cold Season. I'll be keeping an eye out for Alison Littlewood's next release.